A Beautiful Little Heaven… What could be better? How about when it has delicious food and drinks. I spend a disturbingly large portion of my time abroad searching for my next meal. Maybe it’s a consequence of growing up in the bizarre food surplus of the Bay Area (quote from last night: “What, they’re closed? But it’s not even 10:30 yet, and I want gelato! Fine, let’s go to the 24-hour artisanal doughnut shop around the corner.”) or one too many dinners of squished granola bar dug out of the bottom of my bag, but when I find a good place to eat in a foreign town, it tends to anchor my mental map of the place. 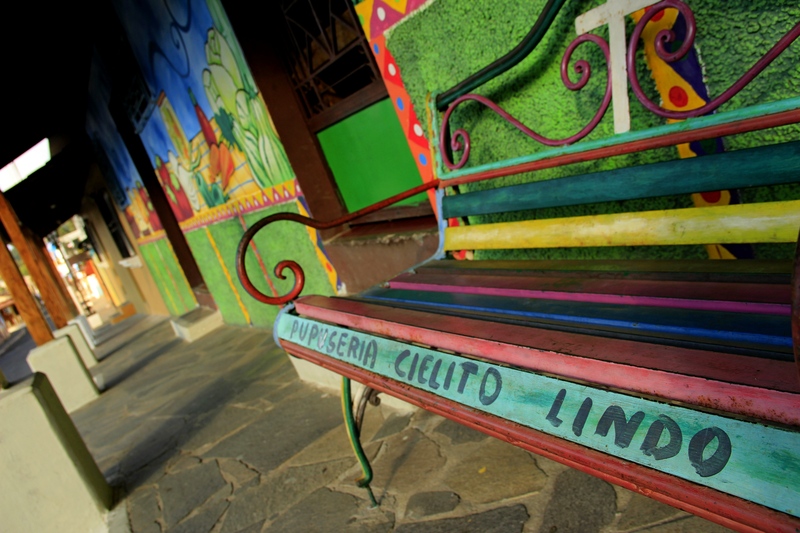 So as far as I was concerned, El Cielito Lindo was the hub of Ataco, a small town of whitewash and vivid murals where women carried trays of fresh bread on their heads, in the highlands of El Salvador. As in much of Latin America, much of the world really, lunch is the main meal in El Salvador, while breakfast and dinner are simpler and smaller. I know that’s healthier, and I know I need to adapt to the culture of the location, but…my day just doesn’t feel complete without a warm dinner. So when I walked the absurdly clean stone streets of Ataco and found the colorful pupuseria, I had to try it, even though it was a little late in the day, the sky already given over to violet and the last bars of birdsong. The national food of El Salvador, pupusas are kind of a cornmeal pancake/tortilla filled with a variety of ingredients, the most common of which are cheese, refried beans, and shredded pork. 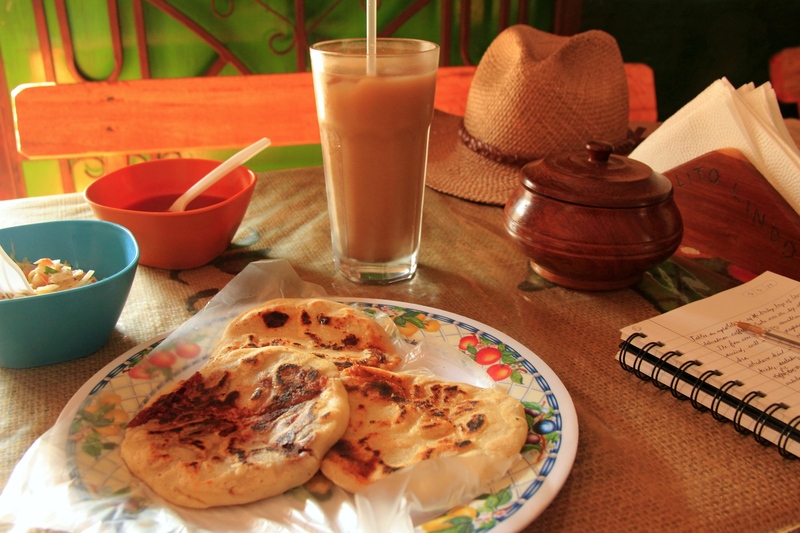 They are similar to Colombia’s arepas, except while those use ordinary corn dough (and don’t always have filling), pupusas use nixtamal, which is cornmeal treated with an alkaline solution that helps peel the grains, accessing additional nutrients. Not impressed yet? That process has been going on in this area for thousands of years. In Joya de Cerén, a village of the Pipil people that was buried by volcanic ash 2,000 years ago, they found the implements for making pupusas. Pompei didn’t have pupusas. I’m just saying. No, it’s not normal to have that many options. 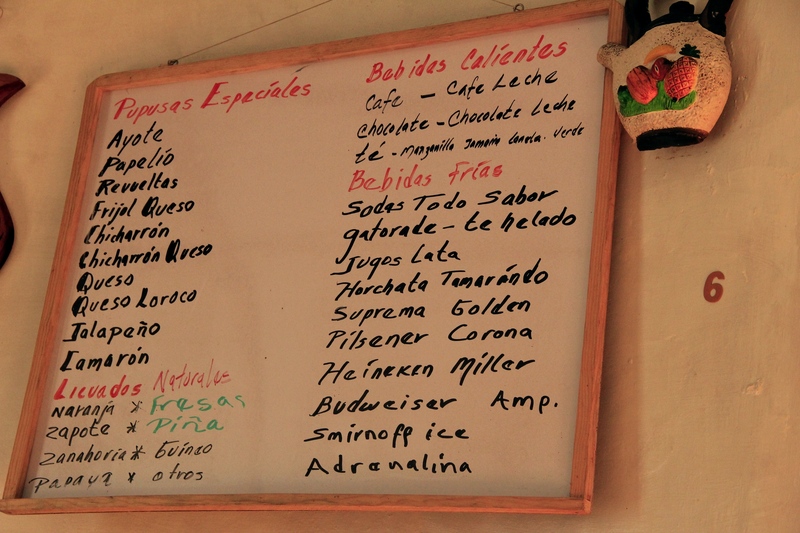 I sat at a solid wood table covered with the burlap sack of a local coffee grower and looked up at Cielito’s menu. Cheese, beans, and pork may be the normal fillings, but Cielito doesn’t stop there. They had every permutation of the three classics, plus jalapeño, prawn, and three things I’d never heard of. I ordered one each of the unknowns, plus an horchata. I am not good at identifying ingredients, comically bad in fact, but something in this drink’s ancestry made sweet love with brown sugar. There was none of the starchy smoothness of rice, instead a deeper, nuttier flavor, with a subtle current of something almost…fruity? But just like (what I now think of as) “Mexican” horchata, this Salvadoran stuff hit the tongue with so much sweetness you thought you wouldn’t want more. But then a second later…gimme more! That’s the sort of table I’d cross an ocean to find. Then the pupusas arrived. The matron of the place, Mauda, left her telenovela to bring me a plate of steaming nixtamal pupusas with queso de loroco, ayote, and papelío. I tried to wait until they wouldn’t burn my fingers, but couldn’t hold back. Loroco is an edible flower, and the cheese made with it had a much stronger flavor than most of the savory white cheeses of Latin America. Kinda like a gamey feta? It made for an interesting change of pace. Ayote is a type of squash similar to a pumpkin, and they use the whole plant: flowers, stems, and shoots in addition to the fruit. It was a fairly subtle flavor, which I prefered to the loroco. Papelío. I had no idea what this was, and l’internet now informs me that it’s a type of butterfly. Odds I ate butterfly? Not good, I’m guessing it’s a more poetic naming, but I have no idea what it was. But it was, unsurprisingly, delicious. The pupusas were, of course, served with curtido, the customary tangy cabbage slaw made with vinegar and chili peppers, that is lightly fermented. Pupusas steaming on the plate, horchata in hand, I was smiling when the youngster walked by, saw me, and stopped mid-sentence to stare at me, somehow shyly. 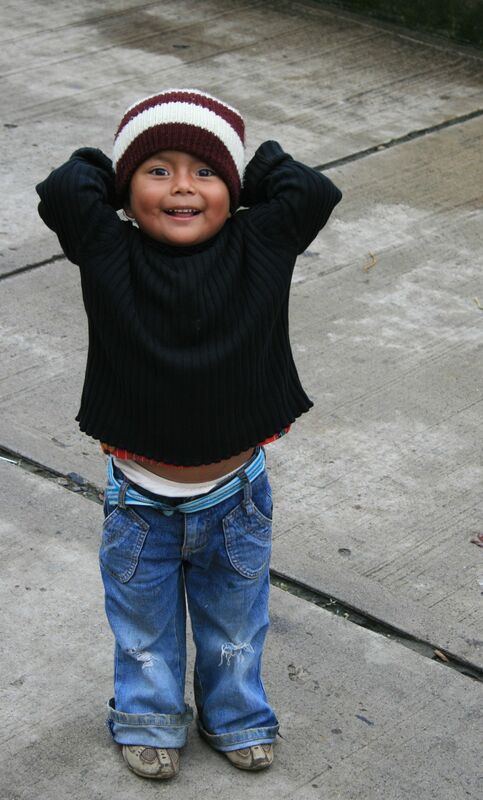 My hands were full of food, not camera, but this little dude I met in Guatemala could be his twin brother. I wasn’t the first tourist he’d seen, not by a longshot, but there are still not so many of us there as to be boring, and he giggled when I made a face at him and winked. Delicious pupusas burning my fingers, new drink cooling my tongue, telenovelas and animated conversations bouncing around my ears, beautiful Salvadoran town to explore, and now this little dude’s laughter to top it all off? This is why I love travel. ← Is that a good start or a bad one? Jungle Birthday Part 2. I have family that run a development agency in El Salvador. I have been there many times and can attest the wonderful goodness of pupusas. I crave them even now. It is a beautiful country filled with some of the most generous people I have ever met. Enjoy. I’m jealous. I’m jealous too! Many times? I only have the one…so far. Cheers, and pupusas for all! Yes, over the years that they lived in El Salvador we traveled many times to see them and the amazing work they do there. We also went to Guatemala to see the incredible beauty of the land and the people. Guatemala is truly amazing. I think Central America is largely overlooked by Americans looking for adventure. While it can be violent, it is also incredibly generous. A study in contrasts I suppose. What an adorable boy, and good for you for trying not one, but three flavours you had no idea what they were! That’s brave 😉 I’m from Mexico City and I’ve never heard of any of them. Have you had the other, darker horchata? Very distinct from the rice version. I haven’t tried that horchata either 🙂 never seen it. But do we really live of eternity in view??? You have inspired me to go back to the late night pupusaria over on 16th, off Mission next time I close down the clubs. . . and maybe I will follow it with a gelato. Excellent decision. And pupusas and gelato? That’s globalization at its finest! This post is a quintessential moment of travelling, and even though I have never been to this place, I can relate to it so much – especially with the little kid at the end! ps. that horchata drink sounds fantastic – all those flavours have got my imagination running! I would love to go back to Ataco, and I’m very glad to hear that you’ve enjoyed Cielito Lindo too. And that hotel…I think it’s actually the one I stayed in! I am getting seriously nostalgic here. I want to go back!